Freshman Cade Valdez watches his partner, Freshman Owen Mick do his workout. 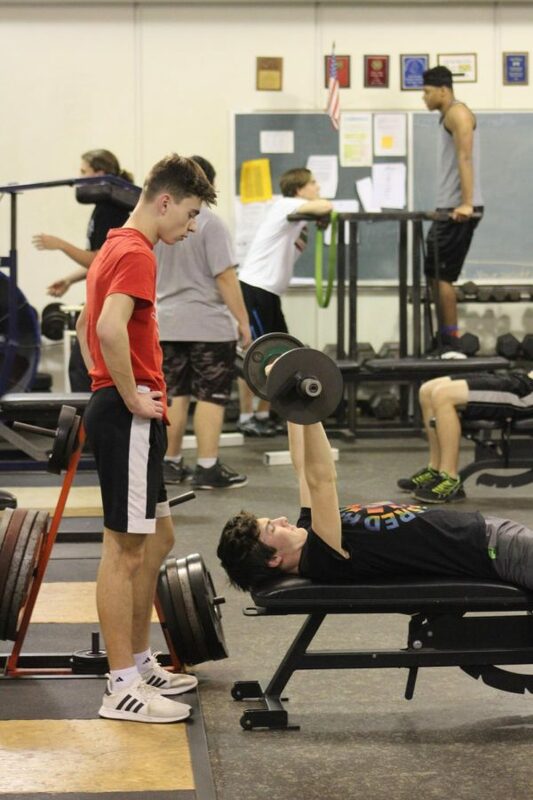 Everyday after school players from both the Football and Baseball team go to the Weight room and workout to help make their team and themselves better. Usually they go straight into working out when the coaches get in there. But today was different after a hard week of work Coach George let the players start the workout off with one of their favorite games Spike ball. “We had a good attitude going into the weight room all week and also so we could get our blood pumping so we could be warmed up for the workout.” Sophomore Griffin Davis said. After a couple games of Spike ball. The players got together to listen to Coach George explain the workout which was Pump day. After Coach George was done explaining they got right to work. “ I never really know what the Friday workouts are going to be it is like opening up a present on Christmas…you never know what is is going to be all you know is you might not like it.” Sophomore Luke Boston said. Both teams are working for something this off season for Baseball it is there upcoming season and for Football it is to get better as a team and personally.